This powercat design is aimed at simplicity of construction, layout and operation. Developed from history of my other powercat designs, it offers good cruise speeds and economy with moderate horsepower. 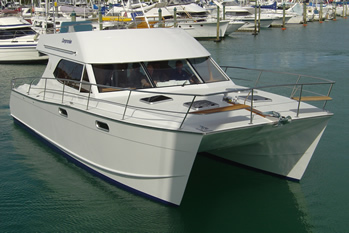 It is an ideal coastal/lagoon family powercat at a realistic price. Performance and safety have already been proven as the first from this design. Its maiden voyage was from New Zealand to New Caledonia, its present home port.